Things may exist at three levels: If they are sighted they have original true existence; if they are imagined by us (i.e. seen by the eyeof the mind) they have formative, acknowledged existence; and if they areexpressed in words (i.e. verbally) they have verbal referential existence. Verbal referential existence expresses the formative acknowledged existence that embodies the original true existence. If things were not sighted they would not have been imagined, and if they had not been imagined they would not have been acknowledged by the human being and hence not expressed in words. These three things, though ostensibly different, are identicaland parallel; each one has its specific characteristics, and so are thename, the named, and the naming. God’s name is Allah; the named, Glory be to Him, is theExalted Being; as for the naming, either it has been done by the peopleor by Him, and in either case the name has been known and acknowledgedsince eternity. 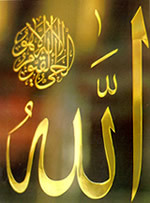 When Allah inspired the people to utter His name,the verbal existence was thus established; His Name is eternal, as faras the formative acknowledged existence is concerned because it has beenknown to Him since eternity, but as far as the verbal existence is concernedit is incidental when it is uttered by the people. 1) The Impossible in Itself: Is that whose non-existence is not due to any cause save the impossibility of itself, such as the impossibility of the existence of any two contradictory elements at the same time, i.e. we cannot assume the existence and the non-existence of one thing at the same time, this is not accepted by the mind. The Impossible does not exist in minds nor in reality. 2) The Possible by Itself: Is that whose existence and non-existence are due to cause. All the existing things perceptible by our senses are an example for the Possible by itself; they need a cause to exist andanother to cease to exist. The existence of the cause must precede theexistence of the Possible, and anything that is preceded by non-existenceis incidental, hence the Possible is incidental because it is precededby non-existence. Possible things not only need a cause to exist but they also need a cause to continue to exist. This cause is the originator, the donor of existence, and the true doer; it grants existence to these possible things. As long as the Possible needs a cause to exist, then they needa finder; this finder can neither be an Impossible nor another Possible, so it could only be the Necessary Being, whose existence is the truecause of all existence. 3) The Necessary Being: Is that who is self-existent and whose existence is not due to any other cause save its true presence and epithets; i.e. if this Being is imagined by the mind in an absolute manner, it cannot be anything other than what is imagined. It must be eternal. If we assume anything save this, then this will denote that it has a period of non-existence, and anything whoseexistence is preceded by a period of non-existence is an incident andneeds a cause to endow it with existence. If the Necessary Being was noteternal, it would have needed an originator, and this is impossible becausethe Necessary Being is that who is self-existent; it needs no cause toendow it with existence and is the originator of all existing things. Non-existence can never befall the Necessary Being, otherwise it would be deprived of itself and this is impossible. It must not be composed of parts, because if this were thecase it would have required the precedent presence of these parts, whichhave an independent existence. Hence it would have needed the existenceof something else, and the existence of the Necessary Being is not dueto any cause save itself. Moreover, if it had been composed of parts itsexistence would have depended on the existence of these parts. It must not be divisible, because if it had been divisiblethe resultant would have been a number of partitions, consequently anumber of existing things liable to non-existence or composition, andthis is impossible as aforementioned. It must be omniscient; its all-inclusive knowledge must precede the acknowledged so that the acknowledged coincides with the eternal knowledge of the Necessary Being. It must have absolute ability so as to be able to originate and create all the possible and potential things, the means of their existence, their survival, as well as the causes of their annihilation. It must have an overwhelming will and absolute freedom of choice, as all the possible things exist at a certain time and according to certain characteristics, and it could have been otherwise. Therefore they exist according to the eternal will of their originator and creator. It must be ever-living in order to grant life to all living things. Its life must be eternal; it is the life that is neither affected by sleep nor slumber, or else its knowledge, ability and will would have been reduced, and this is impossible because all possible beings are in constant need of the absolute existence and presence of the Necessary Being. It, solely, must have absolute existence, with no other Necessary Being or grantor of existence. If there had been any other Necessary Being it would have been either a helper or a rival. The existence of a helper would mean that the Necessary Being does not have absolute ability, while the existence of a rival would have spoiled the order of all possible things because of differences in wills and choices. It must have no limited essence, because every essence isrestricted to a limited space in which it must either be still or moving;both stillness and motion are incidental, and anything associated withan incident is incidental. It must have no body. Since it has no limited essence, itmust have no body as every body must have a spatial limit and must bemade of a number of matters, and all these qualities apply only to incidental things. It must not require a body to occupy. Anything that occupies a body is temporal and is not self-existent, but requires the existence of this body preceding its own existence. Every body is incidental and needs the precedent existence of its creator. How would the Necessary Being occupy a body if its existence had been eternal? This denotes that this Beingis self-existent, has neither a limited essence nor a body; is not temporal and does not need a body to occupy. It must not be restricted to directions. All directions are incidental and described in relation to the human body; they are either above, below, in front, at the back, to the left or to the right. Ifthe human being had been created in a different shape, e.g. as a sphere,there would have been no directions created. Therefore, it is impossibleto assume that any direction can be attributed to the Necessary Being,or that it can be restricted to directions. How could any direction beattributed to the Necessary Being if all directions are incidental? All the epithets of perfection attributed to any created being must be attributed to the Necessary Being in the most perfect manner because it is quite illogical to assume that the created being is more perfect than the creator. Thereupon, the Necessary Being could only be one, having no partner; unique with no equal; self-existent having no opponent. It must be the first with no beginning, subsisting without cessation, eternal and everlasting with no end. Moreover, it is not a formed body and does not resemble bodies neither in form nor in nature. This Necessary Being is ever-living, never seized by slumber or sleep; it can never be affected by death, non-existence or annihilation. It has absolute power, having the ability to create and invent; it is omniscient where its all-inclusive knowledge encompasses every single thing. Thisperfect knowledge is eternal and is neither altered nor corrected accordingto events. What occurs is only what the Necessary Being wills, and whatit does not will never occurs because its will overwhelms its creatures;it accomplishes everything where nothing can escape its all-inclusive knowledge, nor is anything beyond its power. Thereupon, the mind must perceive the essential inter-relationbetween the creator of existence and every existing created being. Byknowing this co-relation every human being eventually comes to know hiscreator, his duties, and the wisdom behind his existence. This co-relationmust take place through a mediator because it is difficult for the ephemeralto perceive or communicate with the eternal. The mediator must be selected and qualified by the Necessary Being, and must be of the same race as the people to whom he is sent to instruct. This proves the necessity of sending messengers so that God’s existence is revealed to human beings through legislation and conveyance, after His presence is perceived by logic and mental abilities. After the truthfulness of the messenger is proved by the mind through evidences, manifestations, and miracles, then he should be believed and listened to, so that what he has to convey is properly understood; here the mind’s role comes to an end and the believer must totally entrust his soul to Allah and submit to His Guidance. Prophet Muhammad, Allah’s Prayers and Peace be upon him, revealed to us some of Allah’s attributes in whichwe should believe, such as (the All-Hearing and the All-Seeing Powers,Speaking, and the Firm Establishment on the Throne), as was inspired tohim by Allah, “..there is nothing whatever like unto Him,and He is the One that hears and sees all things” (SHURA, 11), “..and to Moses God spoke direct”(NISAA’, 164), “..and is firmly establishedon the Throne” (A‘RAF, 54). The Epithet of the All-Seeing Power: Through this epithet all what is seen is revealed to Allah. The Epithet of the All-Hearing Power: Through this epithet all what is heard is revealed to Allah. The first verse proves the epithets and attributes them to Allah and negates that these two divine epithets can resemble His creatures’.These two divine epithets do not need an organ but they are two divineepithets of perfection. This is proved in the Qur’an by the story of Abraham,“..why worship that which heareth not and seeth not and can profitthee nothing?” (MARYAM, 42). Nothing can everescape His All-Seeing and His All-Hearing Powers. The Epithet of Speaking: Allah, Praise and Glorybe to Him, is still speaking His Divine Word through His Divine Will and Power. What is said by Allah is self-existent and cannot be separated from the Exalted Self. Allah’s Word follows His Will; it doesnot resemble His creatures’ words. The Establishment on the Throne: Allah is firmlyestablished on the Throne in a manner far above settlement, locationor movement. The Throne doesn’t bear Him but the Throne along with theangels that bear it are subdued by His Omnipotent Grip. We can say whatmay seem paradoxical: The establishment is not unknown to us, the modalityis beyond our logic, yet we must have faith in it. Prophet Muhammad, Allah’s Prayers and Peace be upon him, instructed us to other epithets that are mentioned in theQur’an, “Say: He is God, the One and Only; God, the Eternal, Absolute;He begetteth not, nor is He begotten; and there is none like unto Him.”(IKHLAS, 1- 4). The One and Only (AL-AHAD): Is that Who is too exalted to be compound, multiple, or what these two epithets may require, such as being corporal, space-limited or having a partner. The word Al-Ahaddenounces from every aspect that anyone or anything could resemble Allah as a Being, in His Epithets, or in His Divine Acts; Al-Ahad also denotes that epithets of perfection could only be attributed to Him. That is why only Allah could be named Al-Ahad. The Eternal, Absolute, Besought of all (AL-SAMAD): Allah, Praise and Glory be to Him, is Self-Existent and Besoughtof all. He depends on no person, but all beings and all things depend onHim. He begetteth not: Allah does not need anyone to help or succeed Him. Nor is He begotten: This is because He needs nothing, had not been preceded by non-existence, and had been derived from nothing. And there is none like unto Him: All epithets of supremacy, perfection and might are attributed to Him. Moreover, Allah describes Himself as the Ever-Living and the Self-Existent. The word (the Ever-Living) includes all epithets of perfection of the Supreme Being; the word (the Self- Existent) includes all epithets of perfection of His Divine Acts. Let us delve in an attempt to reveal lights of the Divine meanings of the Most Beautiful Names of Allah, Praise and Glory be to Him.